The latest Uncommon Threads challenge was Music. 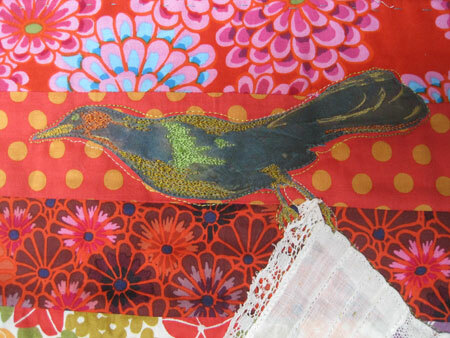 While at our retreat last fall,I played with some “birdie” fabric and lacy stuff that Merrilee brought, then put it away. How serendipitous! I pulled it out and created my challenge from what she gave me. 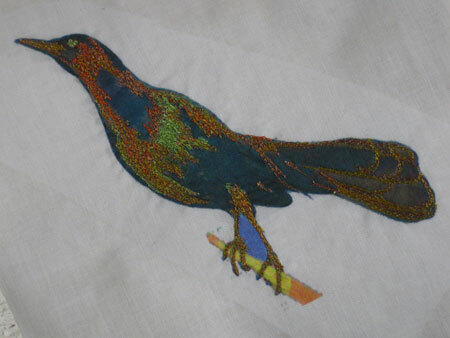 The dots are beads and the blue wings are hand embroidered with metallic thread. A real nightingale is just another brown bird, but with such a beautiful name I think it should be more colorful! 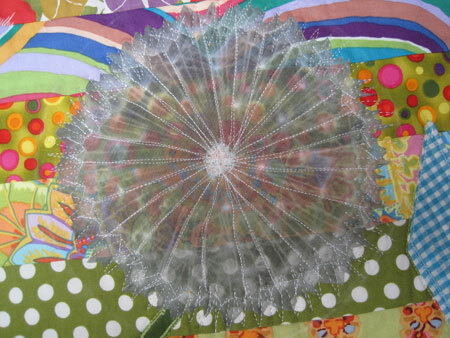 My free hand machine quilting is getting better but still not what I want it to be. 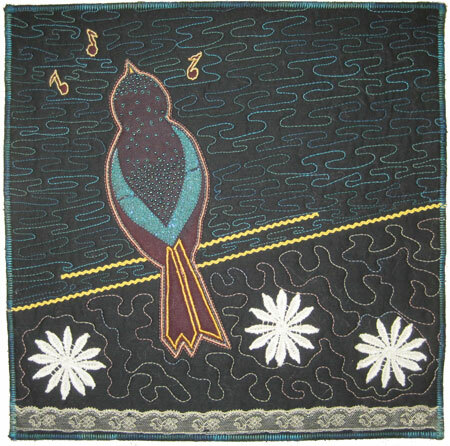 The title, “A Nightingale Sings” is from the title of the song, “A Nightingale Sings in Barkley Square.” You should hear Nat King Cole sing it. Oh my! You can view the rest of the groups’ work here. 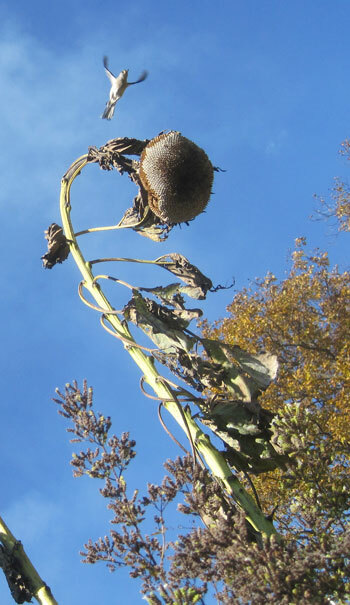 We’re fortunate to be in the migratory path of many birds and the monarch butterflies. About a week ago we looked out the living room slider onto the lake and saw some thing huge and white floating in the lake. We grabbed the camera with the telephoto lens and jumped in the car. 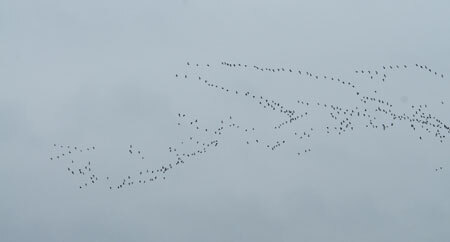 When we go to the bridge we could tell that it was Snow Geese. What you see in this picture represents only about a fourth of the total number. 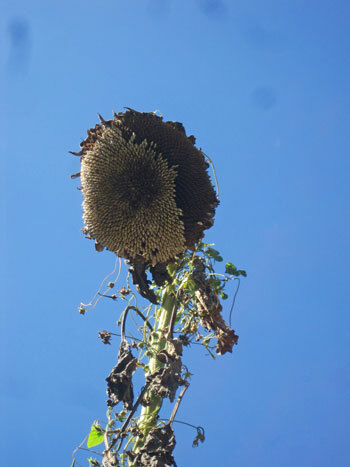 The picture is a little out of focus ’cause the lens is heavy and I forgot to grab the tripod but you get the idea. 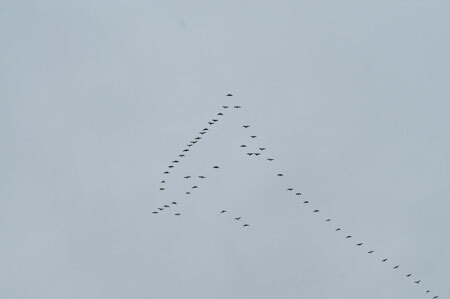 Then today the Canadian Geese were flying over head, wave after wave of them. It’s a spectacular sight. And this group came right over the house. They make such beautiful formations. The latest Uncommon Threads Challenge was “Peaceful Waters” which happens to be the title of a song written by Roberta Ranney’s husband, Bob. 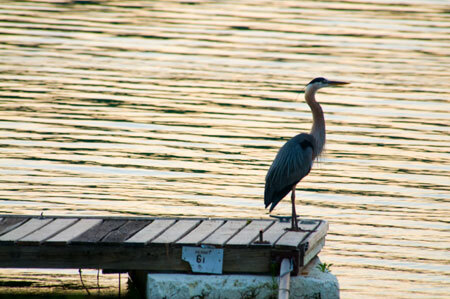 I used this pictures of a Heron that I took at sunrise last year down at our neighborhood boat ramp. 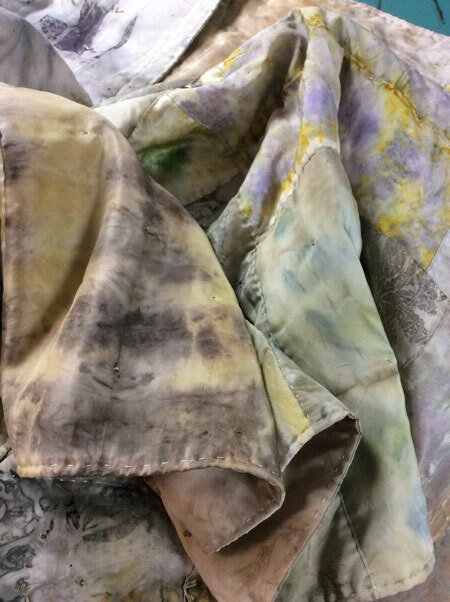 I could have tried dyeing fabric for the background, but that seemed tedious so I found some hand dyed that I bought a number of years ago and have been saving for a special occasion. This is the occasion. 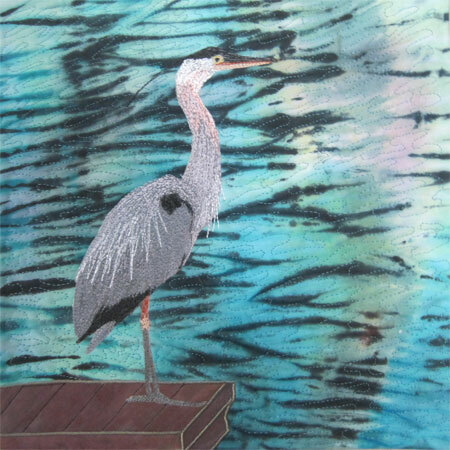 I printed the heron onto fabric and then machine embroidered all over it and fused “him” and the dock to the background. You can see all the Peaceful Water challenges on the Uncommon Threads blog. Click here. There has been an unfinished art quilt on my design wall all summer. Finally, I am trying to finish it. The machine embellishment is almost done. 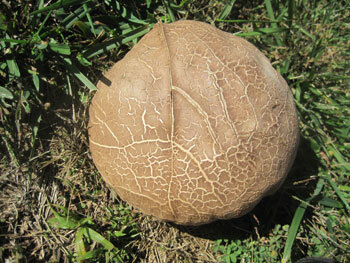 Whether you recognize it or not, this is a dandelion. And this is a grackle. I love grackles. Some folks think they are a nuisance, but I think they are comedians. This may become my signature bird! It’s been a long time since I’ve done any machine embroidery and I’d forgotten how much fun it is. 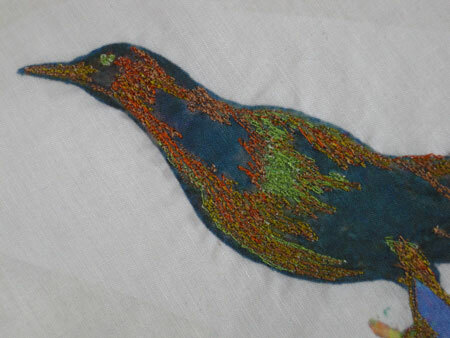 After printing the grackle on fabric, I highlighted the bring colors with freehand machine embroidery then ironed wonder under to the back of the bird and fused it to the art quilt. He shows up on his background much better now. I also, just slightly, painted/rubbed a little interference gold on the stitching to make it a little more sparkly but that doesn’t show in the picture.